The Trump administration is quietly dismantling a historic government agency that has policed discrimination among federal contractors since the New Deal. The dramatic move—pushed by lobbyists from the Heritage Foundation now working in the White House—to disband the Federal Contract Compliance Programs has enormous implications for an American workforce where nearly one of every four workers is employed through federal contracts. The agency has its origins in the Fair Employment Practices Committee (FEPC) created through executive order by President Franklin Roosevelt in 1941 after labor and civil rights leader A. Philip Randolph threatened to lead a “March on Washington” of 100,000 African Americans to protest rampant discrimination in the wartime defense industry. Many black activists and writers had spent the early war years pointing out the hypocrisy in being conscripted to fight fascism abroad while the American government oppressed black citizens at home. 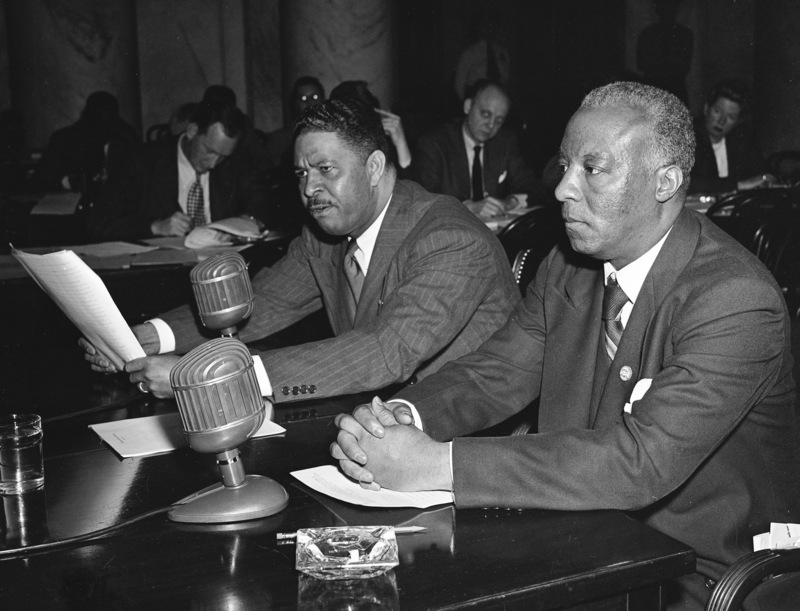 The FEPC was a landmark achievement for labor and civil rights leaders who were able to translate black demands into federal legislation for the first time since the Freedmen’s Bureau during Reconstruction. By the end of World War II, the number of jobs held by African Americans was at an all-time high. In 1942, African Americans accounted for only 3 percent of all defense-industry jobs. By the end of the war, they made up 8 percent, and 200,000 were employed by the government, more than three times the number before the war. While still confronting racism and discrimination, black workers saw their wages increase, and many held onto their jobs well after the end of the war. Thousands of black women also found work in wartime industry—often only after the FEPC intervened on their behalf. Washington, DC, and Brooklyn’s Navy Yards hired its first black women in 1943 and 1945 while complaints continued to be filed in much of the auto industry. Many writers on the left, including Slate’s Jamelle Bouie and The Atlantic’s Ta-Nehisi Coates, have come to see New Deal liberalism as inseparable from the maintenance of white supremacy. Undoubtedly, white-supremacist politicians and voters who both supported Roosevelt and Jim Crow were part of the coalition that passed the New Deal; they were also the group who filibustered some of its most egalitarian proposals. But if the New Deal—either as a set of programs or as a new form of liberalism—contained racist elements, it also created institutions that advanced racial equity. The FEPC marks the dawn of a more complex, multiracial class politics during the New Deal Era. It was a time—like the civil rights era which followed it—marked by a Democratic Party at war with itself: White-supremacist Southern Democrats confronted a new social democratic faction led by progressive unions, civil-rights organizations, and urban liberals. By 1937, the NAACP reported that “not in fifty years has America witnessed such interracial solidarity” as put forward by the CIO. As Eric Schickler discusses at length in his book Racial Realignment, the FEPC came into being during a time when progressive leaders of labor unions, most notably in the Congress of Industrial Organizations (CIO), began to see the New Deal era as one where unions could flex the muscle of newly organized interracial unions and create a faction in the Democratic Party dedicated to multiracial social democracy and the destruction of the Southern Democrats. The CIO leaders warned that if Southern Democrats were allowed to maintain a racial caste system, the region would remain a bastion of low-wage industries ruled by business elites hellbent on destroying workers rights. After the creation of the FEPC, labor and civil-rights leaders redefined liberalism as a project committed not just to economic equality but also to civil rights. In the 1930s, white liberals criticized Roosevelt when he failed to take on big business, but not when he remained silent on Jim Crow. But after labor and civil-rights leaders won the battle to create the FEPC, mainstream liberal leaders and publications began—for the first time—to strongly condemn Roosevelt’s reluctance to tackle racism. This put into motion the beginning of a historic realignment that ultimately transformed the party system after the passage of the Civil Rights Act in 1964: African Americans, urban white liberals, and progressive unions on one side and Dixiecrats and Republican big-business conservatives on the other. Eventually Roosevelt’s FEPC, like most racially egalitarian policies of the era, was disbanded by a Southern Democratic filibuster (the FEPC returned in an altered form under President Eisenhower). True collective prosperity continued to be thwarted during and after the war by red-lining, suburbanization, the continued efforts of Southern elites to filibuster any legislation that threatened racial hierarchy, and the eruption of genuine white working-class violence in industrial cities—over 100,000 workdays were lost in a wave of hate strikes against black workers between March and June 1943. Today the rise of Goldman Sachs–approved white nationalism threatens to further divide and conquer working and middle-class Americans of all races. Trumpism constructs racial hierarchies of its own: black against white; immigrant against native-born; Muslim against Christian. Yet, despite all odds, visionary leaders during the New Deal era demonstrated that the possibility of multiracial social democracy was to be found in the twinned task of defeating a racist caste system and redistributing the nation’s wealth. The future of progressive politics and social democracy is the same as it has always been. The ruling class and the politicians it employs use racial fear to break apart multiracial working-class coalitions in order to hoard the nation’s wealth and power. While pundits debate whether economic populism, “identity politics,” or moderation is more necessary for Democrats to win elections, the political revolution and new social movements are beginning to create their own faction dedicated to an egalitarian populism. If social democrats can unite the multiracial coalition necessary to win critical elections, they can bring forth the realignment that their predecessors attempted—yet ultimately failed—to solidify.